North County coastal communities were hit by high surf Friday, bringing dirt and debris into parking lots. 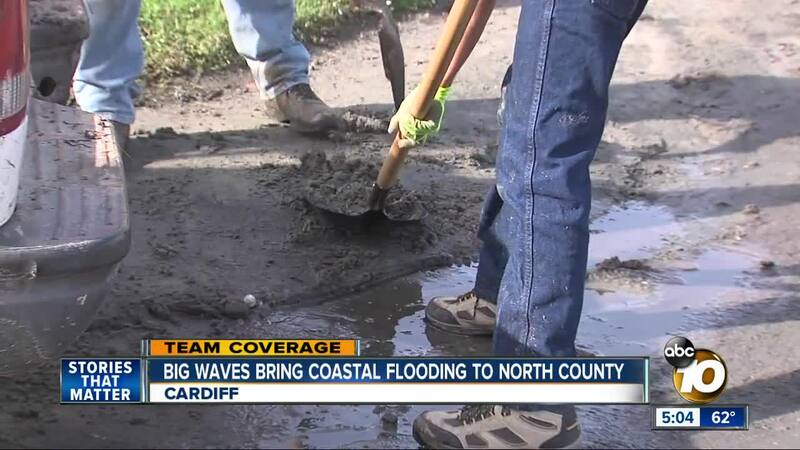 Cardiff (KGTV) — Beach goers in North County were in for a surprise when trying to park their cars. High tides brought in thousands of rocks and sand onto parking spaces. City workers and restaurant employees were using backhoes and shovels to scrape their Valet lots at the Chart House restaurant and the Pacifica Coast Grille along the 101 in Cardiff. State Parks employees were doing the same at Cardiff State Beach. In fact, they closed the entire lot as rocks inundated every open space. At South Cardiff State Beach, rocks scattered across half the entire lot. Some chose to collect rocks, while others set up make-shift rock bowling alleys. High tide and high surf continues until early Saturday morning.